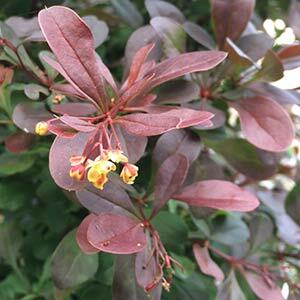 For colour and impact from new foliage until autumn it is hard to beat Berberis thunbergii atropurpurea. Also known as the Red leafed Japanese Barberry, this is a deciduous plant, very hardy and it grows well in part shade to full sun. A small bushy shrub, it is thorny and works well as a barrier plant. The foliage emerges a purple to bronze before taking on an attractive bronze/red in autumn. Once planted and established this is a very easy care plant. Dig over the soil well. Ensure the soil drains well. Spread -To around 1.5 metres. Flowering Time – Late spring to early summer. Foliage – Purple to a red/bronze depending on season.